Step 1 Heat the olive oil in a saucepan or frying pan on a medium heat. Step 2 Add the garlic and cook for 3-5 minutes until slightly golden. Step 4 Stir in the cream cheese, spinach and basil and stir until the cream cheese has become a sauce. Step 5 Add the Parmesan cheese, season with the salt & pepper and give a final stir. 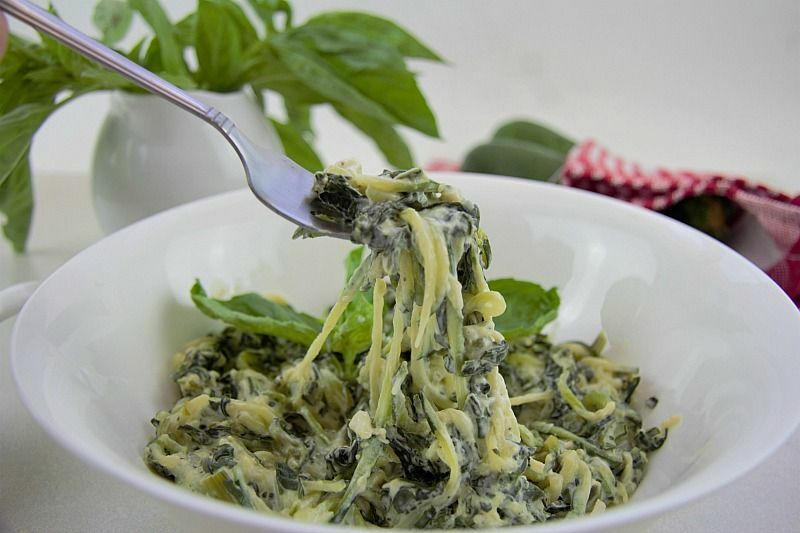 Zucchini noodles cooked in a creamy basil spinach sauce makes a quick dish in under 30 minutes. A dish of green goodness in a bowl. I have made this sauce a few times and love the added flavour that basil gives to this sauce. There’s a local grown basil in our supermarkets that smells and tastes so good I just had to make a sauce with it. So, threw it into some spinach one night and voila! An easy supper dish was made.